David Nelson and Gary Roseme Nelson & Roseme Inc. Audit the system with continually validated data. The entire steam system was optimised, including the pump and compressor drivers, steam production from the boilers and heat-recovery steam generators, as well as electrical production from the gas turbines and turbo generators. This led to substantial operating cost savings. Additional savings were generated through the identification of wasted steam and operating problems, as well as through offline "what-if" engineering studies to investigate alternative utility system configurations. The Tarragona refinery processes eight million tpy of crude oil and is typically a very large energy user with several degrees of freedom. Manipulating these degrees of freedom using a cost-based optimisation program results in significant savings and requires only a small investment. This is particularly important within deregulated electricity markets. Since the electrical system poses one of the main economic trade- offs with a steam system, electricity deregulation makes it harder to operate overall combined systems at a minimum cost. To successfully implement the optimization recommendations, a operator-oriented, well-implemented and understood tool is needed. Operators are generally only concerned with the unit(s) under their direct responsibility and not with refinery-wide energy cost reductions. Frequently, more than one person is responsible for the site (serving different areas), which can make it difficult to co-ordinate overall energy cost-reduction strategies. Also, utility systems are continuously evolving, and a lack of sensors can involve either estimating or calculating non-measured consumptions with modelling systems. Furthermore, utility systems have several constraints, usually originating from the operations side. Finally, it is important to note that the unattended convergence of a refinery-wide utility system optimiser is not a minor issue due to its complexity, especially when energy costs across the entire facility are considered on an hourly or daily basis. Optimisation: the program optimizes the entire steam system, including the pump and compressor drivers, the steam production from the boiler and heat-recovery steam generators, as well as electrical production from the gas turbines and turbo generators. Auditing and accounting: the program's data validation techniques can accurately account for steam usage and track down any waste and inefficiencies. The steam management software also allows for the online tracking of performance, so these savings can be maintained and documented properly. As previously mentioned, the implementation steps involved: data collection; model building; linking of the program to the PI system; online optimisation; model and optimisation review with users; and training of users. The Tarragona refinery shares its utility system with a neighbouring olefins plant. A complete model of this system was built, featuring the entire steam, boiler feed water (BFW) condensate and power system. Steam is generated in several units, including conventional boilers, heat-recovery steam generators and two cogeneration units. The five steam pressure levels were considered and all the units looked at in great detail. Detailed efficiencies curves of the biggest turbines were included in the model and adjusted continuously with online validated data. The program features mathematical models and built-in optimisation routines that make it possible to calculate how to run the steam and electrical systems at a minimum overall cost while still meeting the required plant steam demands and other constraints. Level 4: optimises variables that are potentially unsafe or affect process yield. The SQP optimiser's job is to minimise this objective function, subject to operating constraints in the system. Total fuel cost is determined by the fuel use of each boiler and combustion turbine, multiplied by their respective fuel prices. Total electricity cost is determined by the net electrical use of each motor, load and generator, multiplied by their respective electricity prices. The model takes into account the fact that electricity prices vary throughout the day. Inlet costs normally include charges for demineralised water coming into the system, but can cover other arbitrary costs too. Since the program relies on user input, proper training of the operating personnel using the Repsol Tarragona model was essential. Input from the operators during and after the training helped to improve the way information is displayed. When analysing the optimisation recommendations, a foreman with coverage of the whole refinery, utilities and olefins units was chosen to coordinate the implementation on a daily basis. In case a sensor does not exist or has failed temporarily, the program uses calculated or estimated data. Usually, the main meters needed for optimisation are: cogeneration (steam flow rate), boilers (steam flow rate), letdown valves, vents, flow rates for induction/extraction/condensing turbines and on-off status for turbine motors. Some turbine-motor statuses are updated manually, but an improvement is under way to automate the capture of on-off statuses from the PI system. 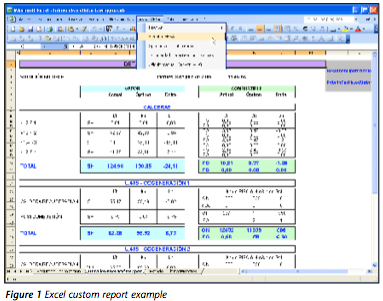 The Excel custom report provides a familiar environment for users to view information concerning the simulation and optimisation of the system. Figure 1 shows an example of a generated report. In the worksheet shown, steam generation and fuel consumption are reported both for the current values and the optimised ones. Data comes to Excel directly from the model. As the steam management program is built around .NET technology, it can communicate seamlessly with Excel. As mentioned earlier, significant changes in steam flows (as well as water flows, temperatures and pressures) are reported so that operators can quickly determine what has changed and alert those responsible, which reduces the chances of a refinery or individual process plant shutdown. Trends of the different sensors can also be viewed with the model. "What if" engineering studies are carried out to evaluate changes (ie, equipment shutdown) to the utility system and assess their technical and economic impact. By auditing the energy system, imbalances can be identified and reduced. The steam management program helps to locate wasteful steam usage. Balloons are used to illustrate the measurement of steam balance closure. They perform the algebraic summation of all the flows for streams entering and leaving the balance. Since there is a value for the flow of every stream, the total should be 0.0 (all the steam that comes in must go out). If the net balance is not 0.0, some meters or estimated equipment flow rates are erroneous, or there is steam leaving or entering the balance that has not been accounted for. The balloons dynamically show meter errors by changing in size and colour, depending on the amount of steam imbalance. Balloons are placed where there is a chance of a closed mass balance. To validate steam flow data: if all of the flows in a balance continually add up to near zero, the flow data can be relied on for evaluating the value of production and use, and waste can be eliminated; if the balance does not add up to near zero, meters could be wrong or equipment steam flow rates may be different to those estimated and there might be significant waste. To store model errors, for use when comparing one case to another (ie, the actual operation against the optimised one). During the third month, the optimisation suggestions were followed on a daily basis. More than a 4% reduction in total energy costs related to the steam system were achieved by following the optimisation recommendations. At the time of going to press, the system was undergoing further improvements. The program proved to be a robust optimizer and is well suited to routine operation. Themodel helps evaluate "what-if" scenarios that include changes to the utility systems. Auditing and accounting of the steam and BFW help reduce wasted steam and identify imbalances. Finally, continuous monitoring prevents plant upsets and helps to quickly identify steam wastage. It is important to emphasise the high involvement and motivation of the plant operators since the beginning of the software implementation. Co-ordination among plant areas is critical if the proposed optimisation recommendations are to be implemented successfully, so management involvement is crucial too. User acceptance and widespread employment are also key to success. Repsol is currently looking at ways of using the program in several other locations. David Nelson is a principal at Nelson & Roseme Inc. He previously worked at Chevron before helping found Nelson & Roseme Inc in 1997. Nelson has a PhD in chemical engineering from the University ofMassachusetts. Gary Roseme is a principal at Nelson & Roseme Inc, with 24 years' experience in the oil industry. Roseme has a MS from the University of California at Berkeley in mechanical engineering. María Sartaguda Pardos has four years' experience working for Repsol Petróleo SA as a process engineer. Sartaguda Pardos recently moved to the purchasing department in Madrid.